Representatives from Ally, Superior Van & Mobility, and BraunAbility crammed together by the windows of Crossroads Elementary School in Mount Washington, Kentucky, and carefully peeked out at the family in the parking lot. "I see Travis!" someone said, and everyone became energized. He was, after all, the reason we were all in the music room at his school. Hardly anyone, especially him and his family, knew we were there. We watched as his mother, Melissa, struggled to lift her 130-pound fourth-grader from his seat in their minivan into his wheelchair, waiting beside the car. Her boyfriend was there to help, but there was only so much he could do to alleviate the pain in her lower back as she moved him for the second time that morning. Travis has cerebral palsy, and has difficulty speaking because of this. He can't feed himself or even help in the process of moving from his wheelchair to the car and back again. 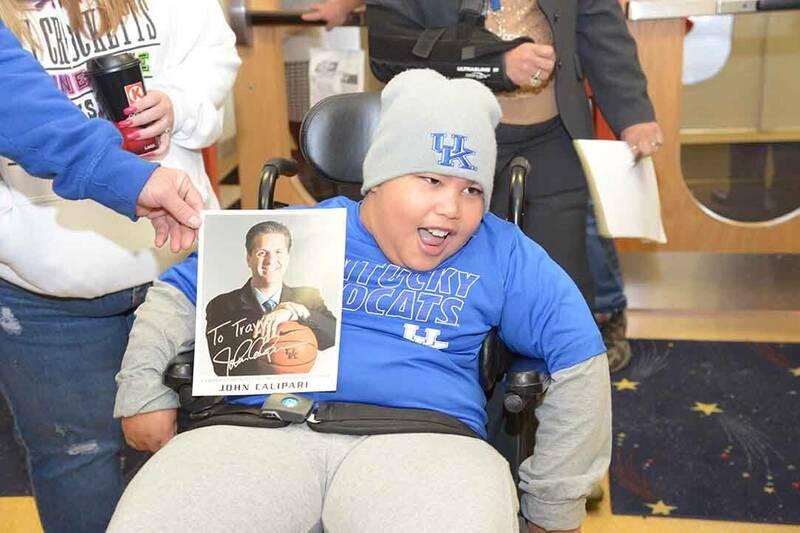 He is a huge University of Kentucky basketball fan and one of the recognizable phrases he says is "Go Blue!" He enjoys going to restaurants and traveling to see family. He loves his school and the friends he makes there. Teresa, a teacher at Crossroads, says Travis has a little fan club at school, and he informed us when we met him that he also has a few girlfriends. We watched the family enter the school and straightened our Team Travis T-shirts as we hid backstage in the gymnasium, where the whole school was packed into the bleachers. We listened as cheerleaders cheered and got everyone excited. Then it was our turn to surprise the family. 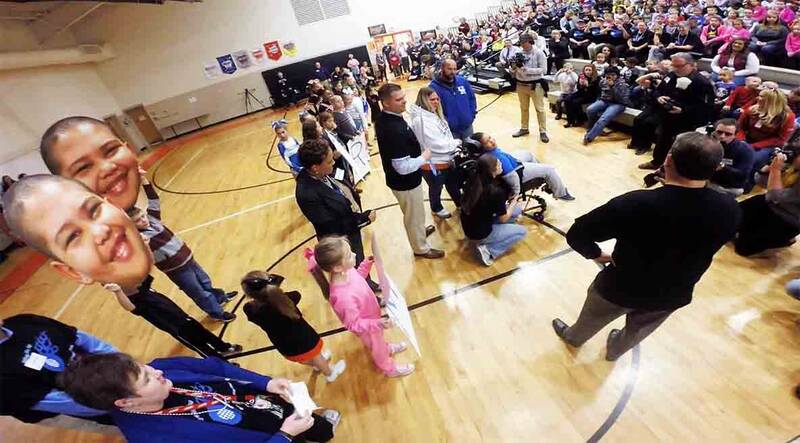 Tim Hargis, BraunAbility's central Midwest sales manager, leaned over to the fourth-grader. "Travis, I gotta tell you buddy, your school and your community think you're a pretty important guy. And I have to agree. A couple of weeks ago you were on the news—are you kidding me? On the news? And it looks like you're going to be on it again," Tim said, motioning to the cameras lined up in front of the family. "With the help of my friends here ... guess what, buddy? We've got a wheelchair-accessible vehicle for you." His finger had hardly finished pointing when the gym erupted into screams, whistles and tears. Melissa buried her face into the shoulders of the many teachers who lined up to give her hugs. And Travis smiled his contagious smile. Outside, they saw their wheelchair van donation for the first time. 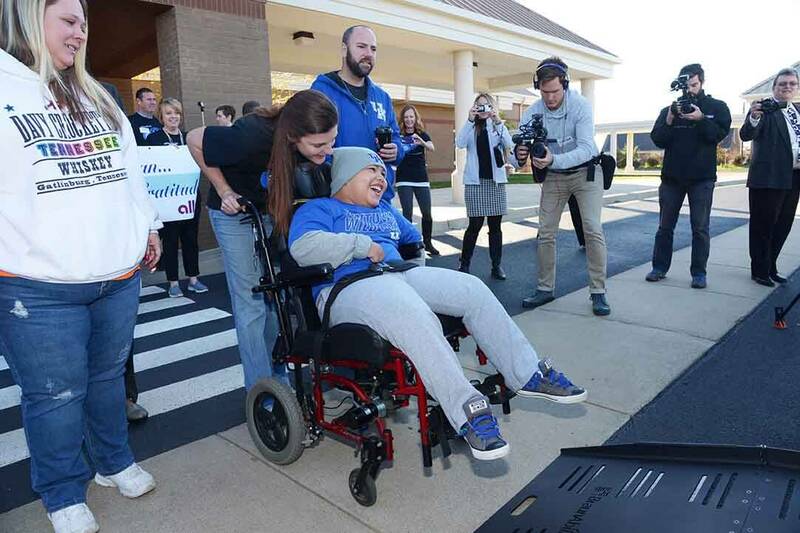 Travis was wheeled into the University of Kentucky blue (Travis' favorite color) Dodge BraunAbility side-entry van and strapped down to test the fit. The whole process was easy and seamless—a huge improvement over the physical transfer that sometimes kept the family from going to the store or visiting family, especially when weather was bad. "He's a handful," Melissa said in an interview with the news crews later. "So this right here is a miracle."